Since I burnt through my free Azure time last year, I have to pay for this. I have set up a credit card etc. 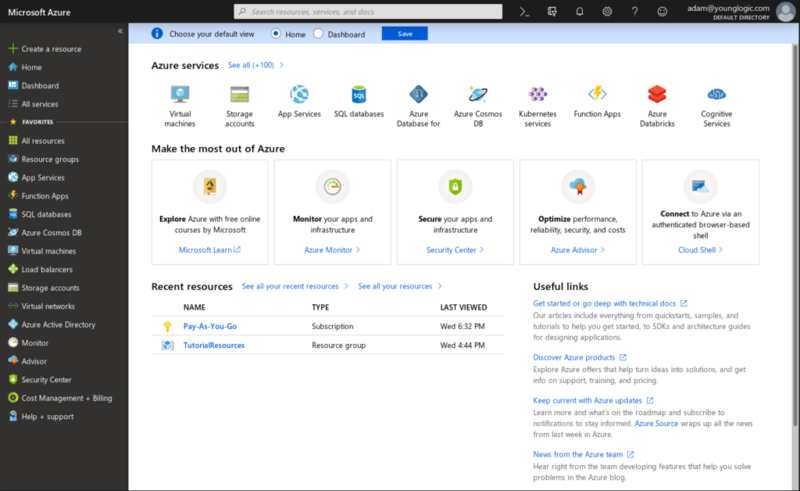 To login, I go to portal.azure.com which bounces me to a single sign on page, and then back to the portal. Using the UI to create a Resource Group and then a VM is pretty well documented, and I will skip over that here. Next was to use the Command Line Interface (CLI). It turns out that the CLI is supported in Fedora. All I had to do to get it was to yum install. $ az login Note, we have launched a browser for you to login. For old experience with device code, use "az login --use-device-code"
I find this a little frustrating, as it is not something I would want to have happen in a scriptable environment. I realize it makes the intial workflow easy, but it makes it harder to figure out how to script azure without human interaction. Once the SSO is complete, I get a json block displayed in the command line prompt window. Please run 'az login' to setup account. The user name might be invalid. For cross-check, try 'az login' to authenticate through browser. [ayoung@ayoungP40 azure]$ az logout [ayoung@ayoungP40 azure]$ az vm list Please run 'az login' to setup account. [ayoung@ayoungP40 rippowam]$ az logout [ayoung@ayoungP40 rippowam]$ az login -u adam@younglogic.com -p $AZ_PASSWORD The user name might be invalid. For cross-check, try 'az login' to authenticate through browser. [ayoung@ayoungP40 azure]$ az account list-locations | jq '. | .name ' "eastasia" "southeastasia" "centralus" "eastus" "eastus2" "westus" "northcentralus" "southcentralus" "northeurope" "westeurope" "japanwest" "japaneast" "brazilsouth" "australiaeast" "australiasoutheast" "southindia" "centralindia" "westindia" "canadacentral" "canadaeast" "uksouth" "ukwest" "westcentralus" "westus2" "koreacentral" "koreasouth" "francecentral" "francesouth" "australiacentral" "australiacentral2"
[ayoung@ayoungP40 azure]$ az group create   --name Rippowam --location "eastus2"
[ayoung@ayoungP40 azure]$ az group create --name Rippowam --location "eastus2"
Now that I can use the CLI, it is time to try Ansible. That is in my next post.